ART in NC Paintings by Artist Clina Polloni, Classes, Portraits, Landscapes, Seascapes, Still Life. 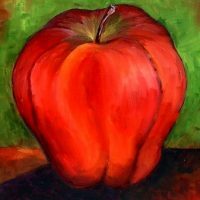 You can learn to draw and paint a red apple in acrylics or oils. Serving Raleigh, Cary, Durham, Wake Forest, Louisburg, Franklinton and The Triangle Area of North Carolina. WARNING, all paintings and photos are copyright © by Clina Polloni. Clina Polloni received the 2017 Franklin County Art Council ARTIST AWARD. Calendar of events, exhibitions and painting classes. Visit Portraits Paintings, Raleigh NC. Clina Polloni Portraits business site. For resent posts about portraits click here. Artists Guild Team Leader of the Franklin County Art Council and Member of the Wake Forest Guild of Artists. North Carolina. How to Paint A Palm Tree at The Beach. Website designed and developed by Clina Polloni. Copyright © 2019, Clina Polloni, All Rights Reserved.